This is a tutorial that I recently found from Christmas 2013. My son and daughter still love this swing. My son Wyatt has ADHD and Autism, he has such a hard time sitting still and calming down after he gets upset or after he has been running and playing. I made Wyatt a sensory swing this past Christmas and he loves it, he will sit in there and come out a new child, relaxed and calm. This swing is easy to make and lots of fun, the best thing is that it is not just for special needs children any child would love it. I do not have the step by step pictures for this one but it is really easy to do. After my son used it for about a month I noticed that he liked to spin so I bought a swivel hook so the chain stopped kinking but it is not necessary. Make sure your chain and hooks are all large enough to support the weight of your child. Step 1. After you have all of your materials pick the spot you would like your swing to hang and find your stud. You can do this using a stud finder or a strong magnet. Make sure you have located the middle of a sturdy stud so your swing will not fall and injure your child. Step 2. Pre-drill a small hole for your eye hook, Insert eye hook into the ceiling, put both ends of your chain on your D ring adjusting the chain so that it will be the right height for your child. Then hang the D ring up on the eye hook. Step 3. Tie all four corners of your fabric around the chain using a few knots. Make sure everything is secure before your child gets in. Now all that’s left to do is enjoy. 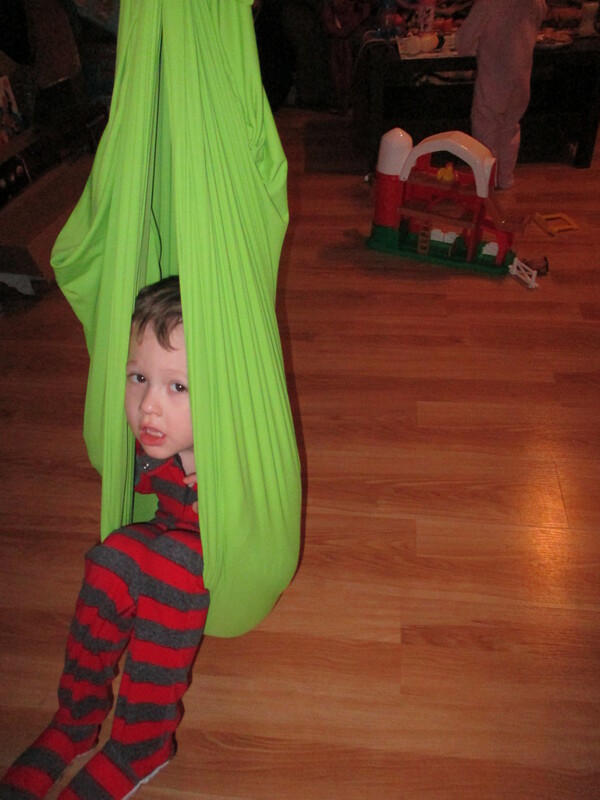 Note: If your child is sinking a lot int the swing you can purchase 3 more yards of fabric and double it up for more support or you can just take the 3 yards you have and fold it in half then tie it to your chain. My 2 year old even enjoys it. Disclaimer: Please supervise child at all times while in this swing.